Is Distilled Vinegar Good for High Blood Pressure? Balsamic vinegar is one of the world's most valued foods, with a bottle of the "real stuff" costing more than some smart phones. However, affordable balsamic vinegar is also available in supermarkets, and that's a good thing if you're looking to lose weight. Used appropriately, this beautiful, tart liquid can help you reach your weight loss goals. Few foods vary in price as much as balsamic vinegar. True balsamic vinegars, or “balsamicos” are made from white Trebbinado grapes that are crushed and boiled to about half their original volume. The resulting grape “must” is then aged in oak barrels for a minimum of 12 years. This type of vinegar can only be produced in Italy and costs approximately $200 a bottle, according to the March 2007 issue of "Cooks Illustrated" magazine. 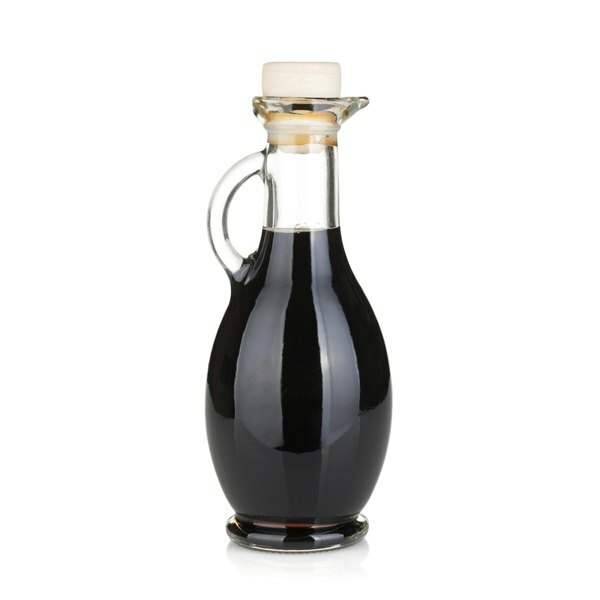 However, "Cook's" reports that supermarket balsamic vinegars, made by concentrating and sweetening red wine vinegars, and which range in price from $4 to $14 per bottle, are acceptable substitutes for day-to-day use. Try several brands and see which you like best. One of the best ways balsamic vinegar can help you lose weight is by providing flavor without many calories. For example, a tablespoon of balsamic vinaigrette salad dressing make from 1 teaspoon of olive oil, 1 teaspoon of juice from a jar of olives -- you can also use water -- and 1 tablespoon of balsamic vinegar contains a mere 43 calories. The same amount of creamy ranch salad dressing contains 73 calories, nearly twice that in the balsamic vinaigrette. Balsamic vinegar may also help you lose weight by helping you stay full. The acetic acid in vinegar seems to help slow the passage of food from the stomach into the intestines, which helps keep hunger at bay, reports "Good Housekeeping" magazine. Other experts agree. According to Carol S. Johnston, PhD., R.D., vinegar eaten with a carbohydrates seems to keep blood sugar from spiking, which prevents a hunger-producing "sugar crash" a few hours later. Balsamic vinegar is one of the most versatile of ingredients. You can, of course, use it to make a salad dressing, but you can also use it for cooked recipes. Celebrity chef and nutrition advocate Jamie Oliver recommends roasting tomatoes in balsamic vinegar with leeks and basil; you can use those tomatoes on pasta, pizza, or to top whole grain bread. See the Resources section for a link to the recipe. As good as balsamic vinegar is, it isn't a miracle weight loss food. Sadly, miracle weight loss foods don't exist. Weight loss is entirely a matter of calories. Weight loss only happens when you consume fewer calories than your body requires to fuel your daily activities, according to the Centers for Disease Control and Prevention. Also, some vinegars contain gluten, so read labels if you have celiac disease or a milder gluten intolerance, advises Drugs.com.